Orson Scott Card Buys the Evertaster Movie Rights! You know how I spent 10 years making VFX and animation for movies? Well, a few months ago, some producers actually approached me and asked if they could buy the movie rights for Evertaster! I just signed the papers a few weeks ago, and was waiting for it to be public before I gave any details. I confess, when I was working on King Kong or Tron, I always dreamed of putting my own story up on the screen one day. I didn’t have 100 million dollars (which is what it takes to make some movies), so I started writing instead. And then BOOM! This happens. The unexpected. The wonderful. 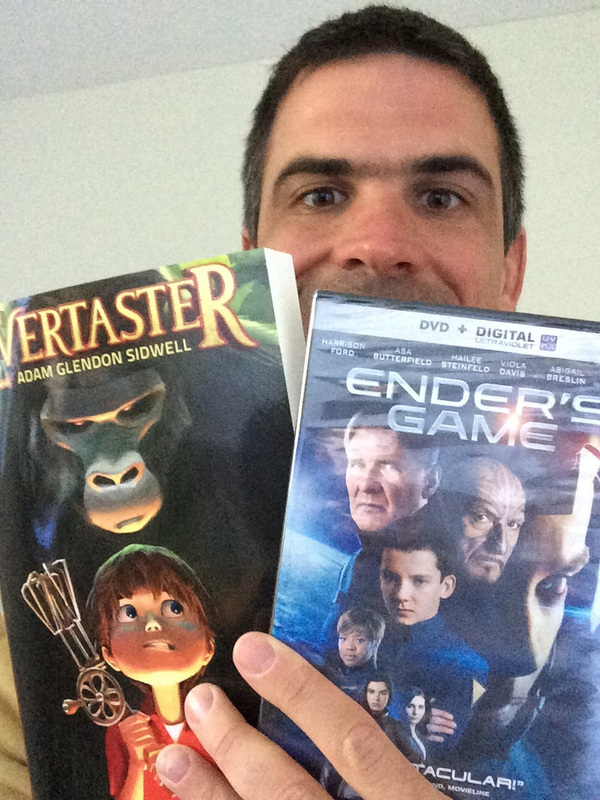 And guess who has set out to turn Evertaster into a movie? Veteran special effects director for TRON and KING KONG, Adam Sidwell’s EVERTASTER, which follows the adventures of an 11 year-old picky eater as he travels the globe in search of the elusive “gastronomy of peace”, the most delicious recipe the world has ever known, all while being pursued by a cult of murderous chefs, to producer Orson Scott Card, and Peter Johnson of Taleswapper, by Alyssa Eisner Henkin at Trident Media Group. So there you have it. Now when will this happen, you ask? This summer? Next year? The truth is when someone buys the movie rights, they have a specific time frame in which they must write a script, hire actors, and find the investors to fund the film and get it made. Evertaster will be an expensive movie to make. Just think about those gorillas and giant chickens the size of tigers! We’ve already had some discussion about what is absolutely necessary and what is not. We sat down in a story meeting and combed through the plot points and character motivation, so that we were all on the same page. Peter Johnson has been great to work with, and Scott Card is so supportive and encouraging! So there’s a long road to go, but this is an incredible first step, and I’m ecstatic to be on this journey. I can’t wait to see you all at the theater. CHUM – coming October 22nd! What do you think? It was designed by the magical Chris Harvey. He is a rendering wizard for Pixar. The contrast of smiling faces and dangerous things fits the story perfectly. Thirteen-year-old Levi Middleworth insists he’s got a Destiny, even if half the internet’s tried to bully it out of him with a viral video. When a Hollywood executive in a trim green suit invites Levi to star on a reality TV show aboard a hi-tech pirate ship, Levi thinks his Destiny’s finally come a knockin’ – a bit of fame is exactly what he needs to finally make some friends his eighth grade year. But almost as soon as they set sail, the games aboard the ship turn savage, and he and his new bud Holly must do everything they can to find themselves some Chums – little round-headed autonomous toys – since failing to do so means getting thrown to the sharks. With the help of Levi’s long-lost television hero and a tech-savvy pirate crew, Levi has to rethink his quest for fame in an attempt to save himself, his fellow contestants, and every human being on the beach from a feeding frenzy of grisly proportions. The FETCH mini cartoon is finished! My buddy Jeff who is a motion graphics artist put this together. I love the music. It feels a little like the Rocketeer to me. I think it needs to be a movie, or at least a Saturday morning cartoon. Read the rest of FETCH here. That wasn’t my video. A couple years later some cool guys (one named DevinSupertramp) went and filmed it. The trick was you had to attach a milk jug to the bike so it didn’t sink to the bottom. Our milk jug broke free and blub blub. The bike was gone. So I started diving. Luckily, I found a pedal on the first try, and hauled it back to shore. When we got it out of the water, we realized it wasn’t our bike. Somebody else lost theirs too. Back I went, and boom! I grabbed hold of another pedal on my second dive. I hauled that one back to shore and sure enough — not our bike. I pulled no fewer than 5 bikes out of the pond that day. So I shared. I gave them away to all the pond jumpers who hadn’t brought their own. Eventually I found our bike, and it was happily returned to its owner. If you happened to be 1 of 5, or maybe 80 who lost their bike to the pond circa year 2001, and you borrowed it from a friend, comfort that friend with knowing their lost bike lived well, and rides on in another pair of hands. Plus, if you whisper the magic word “biplane” I’ll give you a bonus FETCH poster. If you’re not in Utah, or can’t make it, go to your local bookstore or try Amazon. There are some killer deals out there right now. Just click here. Now, there’s one more thing I’d love to do this summer. Tell me in the comments below if you’d do it too. Look! Well, I didn’t sleep much last night. My book is about to get released into the wild. (I wonder if Edwin’s this nervous). Luckily, my Kickstarter friends got copies and have enjoyed them so far, so that really gives you a boost. It’s not that I didn’t think Fetch was great. I always loved it and I think it’s beautiful. Every time I read it I think – there’s not one thing I’d change about this book. It’s just… you wait to for it to finally be revealed so you can hear what people think. The action scene. Can you hear Indiana Jones and the Raiders’ March by John Williams playing? Me too. So far so good. We’ve had some great 5-star Amazon ratings, and people have been posting all over facebook about it. I’m having a good day. If you haven’t yet, go get your copy. You won’t regret it. Click here. Or, if you want to get the special BONUS Poster or Tshirt, go here. Thanks for reading my friends! I started thinking about FETCH more than 2 years ago. In my head it was an animated movie — full of major settings and complex characters. But first I had to get it down on paper. It needed to start as a picture book. Then, thanks to the amazing support of friends and readers, Fetch got its start on Kickstarter. After that, the hard creative work began. 1000’s of design decisions. Should the title go in the center? What font? Scale this page? Use white space? Edwin and I made those together. 100’s of story decisions. Does that picture communicate the idea or is it in the wrong place? Should we spread out the illustrations over more pages? Not to mention the logistical questions: 32 pages or 46? What size? Can we even afford this? Working with Edwin Rhemrev was awesome. He came through in a big way. And now magical things have started to happen. My distributors love this book. They’re going to shop it around to Costco, B&N, Indie stores, and take it to Book Expo America. It’s going to be in stores and on Amazon. So get ready to get a copy of your own. We’re going to be offering some special celebration gifts to you at stores and on Amazon. Here’s one where you can get a FETCH poster and a FETCH T-shirt for ordering on launch day. Check it out. It seems like Salt Lake City didn’t get enough Comic Con back in September, so they’re hosting something called the FanXperience. Which means I get to go again. I’m kind of excited because the Doctor’s most loyal and best (not up for debate) companion will be there. As well as that scoundrel and knave of Bespin, Lando Calrissian. Thursday 3pm: Putting the Movie in Your Head on Paper (this one’s all me). So come say HI. Come heckle me. Or ask some questions that we’ll prearrange smart answers to. I’ll post lots of pics to Instagram (@adamglendonsidwell) and Facebook. Either way, I think this is going to be fun. Merry Christmas and FETCH artwork updates! I’ve been trotting back and forth to Colorado, California, Nevada, Utah and Arizona in the last few weeks, and I’m headed out to Gilbert and Mesa this weekend to sign again at Costco. I think they truly are worth thousands of words! It’s so satisfying to see your words turn into pictures! It looks like FETCH should be done some time this spring (probably April). I’m also in the final revision stages of a book called CHUM that is due to release in the next couple months. I’ll keep you posted about that one too. 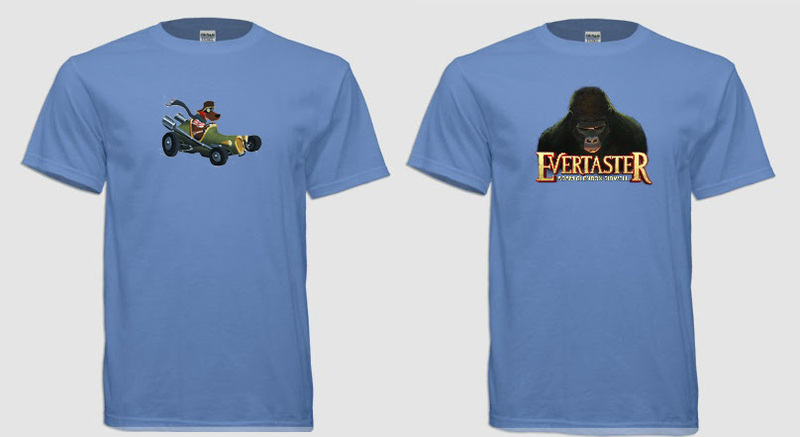 There are also now Evertaster and Fetch T-Shirts available for order on my site (left over from the Kickstarter campaign). We have only limited quantities, but if you order today, and we have your size, we can get it to you by Christmas. Thanks for reading my books. I’ll keep writing them. I hope to see you again sometime soon! Merry Christmas! I spend a lot of time with kids now that I write children’s books. I see a lot of schools both high and low income; I meet a lot of principals, both weary and enthusiastic; I get to see education with a very broad view. There are so many tireless teachers who give their all for the kids, and you can tell when you meet those professionals that they care. The one I’m most thankful for, though, who had more impact on me than any other is my mom. My mom was a reading teacher at my school for years before she started teaching kindergarten. Every week during the summer she’d take us to the Stanislaus County Library to check out books. It was there I discovered Encyclopedia Brown, Lloyd Alexander’s Book of Three and Jack London’s adventure stories. Mom passed on her love of reading to her five kids. Those books became my friends. I still go into that library sometimes, just to see if they still keep my old go-to books on the same shelves where they’ve always been. I wouldn’t want to write if it weren’t for you Mom. Thanks. Is Kickstarter the New Way to Publish Books? I’m riding high right now. Just a few hours ago, my Kickstarter campaign for a book I’ve been working on called FETCH funded 101%. The goal was $22,000, and we got it! Thanks to so many backers (you guys are so great!) who believed in my project, FETCH is going to come to life! Here’s why this is a very good thing: printing books and illustrating books is expensive, and basically Kickstarter gives you a platform for people to pre-order your book before you ever make it. In many ways, this is a publisher’s dream. Publishers fret and agonize and cast perfectly awesome books out the window for a single (yet very important) reason: they think it won’t sell. That’s why they’re so wary to take on debut authors. They have no numbers to show how that author’s work will perform. So what if you had a bunch of pre-orders all ready to go before you even made the book? It would give you the confidence to move forward with the project. Not to mention the capital. Fetch will actually cost more than $22,000 to make. But that seemed like a reasonable goal to hit, and, since Kickstarter is all-or-nothing, setting it higher would increase the risk of coming up with $0. You have to have written the book though. That you can do for free, and it gives your backers confidence in you when you have things to show them. With Kickstarter you’re making a promise. “Hey, if you pre-order this book, I will make it awesome and give you a copy,” is essentially what you’re saying. So, for the next 60 hours or so, the campaign is still live. You can still get in on the action and order a copy of FETCH if you like. Come on by, check it out, because sometimes, dreams really do come true.